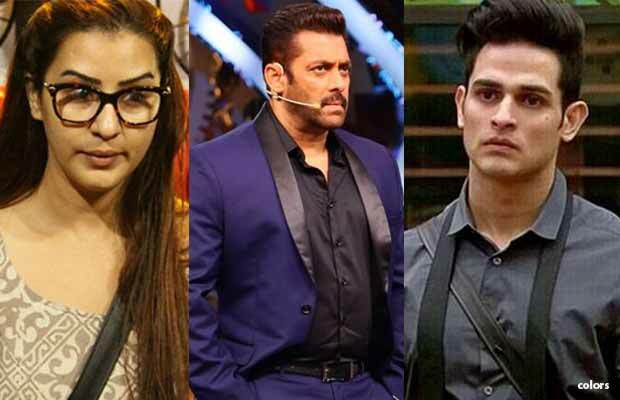 Bigg Boss 11: Priyank Sharma Again BODY SHAMES Shilpa Shinde, To Be On Salman Khan's Target Again? Bigg Boss 11: Priyank Sharma Again BODY SHAMES Shilpa Shinde, To Be On Salman Khan’s Target Again? Priyank Sharma once again body shames Shilpa Shinde, Arshi Khan in Bigg Boss 11 house. Let’s see how Salman Khan deals with it. Since day one, Bigg Boss 11 has been like a war zone where all contestants annoy each other to create controversies. Controversies, fights and arguments are a part of the game but at a limit. Remember how Salman Khan slammed Priyank Sharma for bringing Arshi Khan‘s past after re-entering the house? He despite being told that he cannot reveal anything about the outside world, Priyank spilled a lot of beans on their past. One of his revelations involved Arshi Khan’s Pune-Goa trafficking case, which had put makers of the show into trouble as well. Read Here to know:Bigg Boss 11: Find Out All About Arshi Khan’s Pune And Goa Scandal! This week’s luxury budget task created a lot of chaos in the house. The housemates could not get down to the decision on which team deserves to win the task. As a result, Bigg Boss cancelled the task. Later housemates geared up for this week’s captaincy task. However, they had no idea about what the task will be. While assuming that it would be a physical task, Priyank Sharma, Hina Khan, Luv Tyagi and Sapna started discussing on how Shilpa and Arshi can’t participate in a task that needs them to run. Well, Priyank has once again commented on Shilpa and Arshi and looks like Salman Khan will not spare him. He has body shamed someone again on national television for which he might pay a huge during Bigg Boss 11 weekend ka vaar. Meanwhile, Vikas Gupta, Shilpa Shinde, Arshi Khan, Hiten Tejwani and Akash Dadlani became the five contenders for the captaincy task. For the task, the cut-outs of the five contestants were placed in the garden area. Four times during the day, the gong will ring. After every gong one of the housemates had to reach the platform having a red mark. The one, who reaches first there, gets a chance to spray paint on the cut out of the contender that they don’t want to see as the captain of the house. Finally, Hiten Tejwani becomes the new captain of the house, which you will be seeing in tonight’s episode of Bigg Boss 11. Hina Khan Sapna Choudhary, Shilpa Shinde and Priyank Sharma have been nominated for this week’s eviction. Stay tuned to Business of Cinema.com for more updates on Bigg Boss 11! Watch Video: Bigg Boss 11 Divya Agarwal Makes SHOCKING Revelations On Her Break Up With Priyank Sharma! Previous articleShahid Kapoor To Star Opposite Mira Rajput Kapoor In Her Bollywood Debut?